Christopher loves to play in his garden, but one day he meets a little boy named September and is taken on a whole new adventure! Together they go looking for a lost ball and meet the playful gooseberry boys, Mrs. Bramley Apple, the strawberry families and many more. Along the way Christopher learns all about the different fruit and veg growing in his garden and makes lots of new friends. This heartwarming book about the value of friendship shows Elsa Beskow's classic illustrations at their best, bringing nature alive for young readers. 32 pages, 9 1/4" x 11 1/2", 2003. The charming antics of Peter and Lotta and the Aunts are always delightful, and this installment is no exception. Aunt Green and Aunt Lavender want to buy Aunt Brown a new hat and lace collar for her birthday, to match her dress. But how can they borrow her dress without her finding out about the surprise? Another joyful visit to the household of Peter, Lotta and the Aunts. On a little island in a lake, three children and their mother live in a cottage shaped like a hat. One day, their mother went to the mainland to find yarn to make new clothes for the children. While she is away, the children try to help around the house, but housework is much harder than they had thought. They have lots of fun sweeping the chimney—but they get very dirty. They wash their clothes in the lake and dry them over a fire—but fires are hard to control... What will happen when their mother returns? The Children of Hat Cottage is a charming story from Elsa Beskow about getting help from unexpected places, along with lively illustrations in her classic style. Princess Sylvie has persuaded her father the King to leave the palace gardens and walk in the woods. The King is unsure. What might be in the woods? When Sylvie’s dog Oskar runs off after a long-eared hare, Sylvie’s adventures begin. Princess Sylvie is a delightful story for young children about exploring new places and making new friends... and about the comforts of home. Kelly and Kai love to play on the gnarled old tree trunk outside their cottage in the woods. Sometimes it becomes a horse, sometimes a crocodile, and sometimes even a dragon. One day a mischievous gnome brings the tree trunk to life, and the children are whisked off to the Land of Long Ago on the back of the old tree dragon. On their incredible journey, Kelly and Kai meet a princess, rescue a knight, and trick the troll king. But will the old tree dragon stay alive long enough to bring them home again? A delightful adventure for ages 4-6 and all the rest of us, too. Emily is a helpful little girl, so when her mother is worried that Daisy the cow will escape into the clover field through a hole in the fence, she offers to go and look after Daisy for the day. On the way, she meets a big dog, a boasting boy, and an elderly man with a sack. However, when she arrives in the meadow, she realizes she needs help with Daisy and to mend the fence. Who will help her? Here is yet another delightful picture book from Elsa Beskow. Young children will love following Emily through her day as unexpected, good things come her way. When Flash, a very curious little fish, is caught and held prisoner on dry land, his aunts and uncles are determined to save him. But how can they leave the water to rescue him? With the help of a wise old frog and a little magic, even the most unlikely wishes can come true. This highly imaginative and funny picture book paints the world from a whole new perspective—from a fish’s point of view. Children will delight in the wonderful characters of the lake, and in their extraordinary adventure on dry land. This is the first time this charming Elsa Beskow book has been available in English. 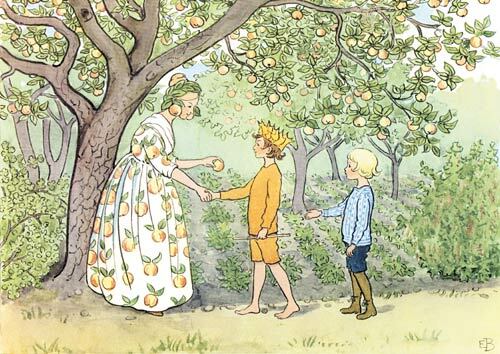 Elsa Beskow’s picture books for children have been known and loved for over a century. This new addition to the Peter and Lotta series is published in English for the first time. The two children go to live in the country with Aunt Green, Aunt Brown, Aunt Lavender, and Uncle Blue. As Christmas approaches, Peter and Lotta discover all kinds of new surprises, but best one of all is when they discover where Christmas presents come from. Is it from deep in the forest, where the tallest fir trees grow? In this first of her classic "Peter and Lotta" books, Elsa Beskow tells how the two children come to meet the three colorful sisters known as Aunt Green, Aunt Brown, and Aunt Lavender. The children have no parents of their own, but live with Washerwoman Wendy who does not like them and thinks they eat too much. They find warm friends in the three colorful sisters who introduce them to other friends throughout their village. After several adventures, the children find the loving home they have craved. The adventures of Peter and Lotta continue! Here, their three colorful aunts and Uncle Blue take the children for a picnic on an island. While the adults are having a nap, Peter and Lotta decide to go and practise their rowing. Disaster strikes when they become distracted adn accidentally lose the oars . 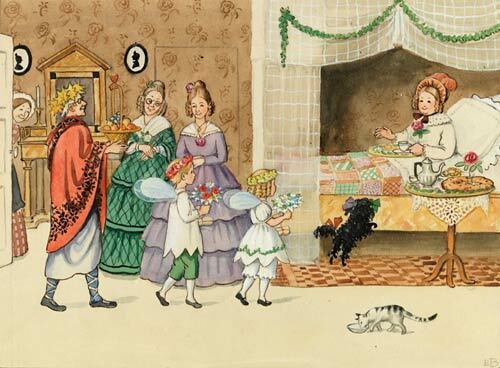 . .
Elsa Beskow takes us through the months of the year with delightful verses and wonder-filled pictures. As with all her books, wonderful for ages 3-5. The adventure is just beginning when the two Acorn children, Woody and Little Pip, get blown away in the wind. They land in an unfamiliar part of the woods and meet up with Hazel, the youngest of the Hazelnut children. Together, they have a day of frolic and fun, and are finally brought home by a kindly red squirrel. Wonderful for all young children! Pelle has one of the warmest spots in our heart. It is the beautifully told and illustrated story of a boy's journey from raising a lamb to getting a new suit made from its wool. Wonderfully real, a lovely way to introduce children to the ways of the Earth. Peter is looking for blueberries on his mother's birthday and he can't find a single one. Suddenly, he feels a light tap on his shoe - and Peter finds himself in the land of the Blueberry King where the inhabitants are so small that blueberry's are picked like apples and mice are ridden like horses. Peter also meets Mrs. Cranberry and her daughters who occupy themselves polishing cranberries which they cook in a pot with honey. Eventually, it is time to go home and the Blueberry Kingdom seems to be only a dream - or was it? Read aloud for ages 3 and up; read by myself from age 8. On Ollie's sixth birthday, his father gave him his first pair of real skis. Of course, it wasn't quite winter yet, so Ollie had to wait - and wait. But then, finally, the snow started falling and one morning it lay thick upon the ground. Ollie strapped on his new skis and set off all by himself. Who should he meet but King Winter himself who takes him to his palace. This is an adventure Ollie is not likely to forget soon - neither are you! Read aloud from age 4 and up; read to myself from age 8-9. In contrast to Pelle, which introduces children to a practical Earth, Children of the Forest affirms the life children experience (and adults usually miss) within the stillness of the forest floor. Here are the little people who wear acorn caps and spin yarn from cotton grass. Their adventures range from meetings with animals both friendly and fierce to encounters with fairies to a romp in the new winter's snow. A truly great story! A large, orange "egg" has fallen into the woods. "It's a sun egg!" decides the elf. Soon, she and her friends find out what it really is, but not before the sun egg is lost and the elf begins one of the best adventures she has ever had. Peter lived in a shabby old little house in the village. He built boats for the children, showed visitors around in ten different languages, and he was the village doctor and handyman. But one day an official comes to tell him that his house must be mended or pulled down. Great for children 3 and up. A simple tale that recounts all the things and creatures that live with the little, little old woman in her little, little old house. A classic for children ages 3-4. Lily is helped on her way by an old tree, a badger, and a hedgehog, until she happily discovers her perfect companion. This enchanting, simple tale and its beautiful illustrations lead into a world among the flowers that will capture any child’s imagination. Little Fairy Faith meets a mother fox and her young cubs who can’t get to sleep, an elf father whose children can’t get to sleep, and the sandman who is filling sacks with magic dust to help children everywhere get to sleep. Finally the little fairy meets a moth fairy prince who takes her to the source of the night’s magic—a wonderful midsummer night’s party—where she dances until she is so tired that she finally falls asleep. This magical, dreamlike tale makes perfect bedtime reading. Faith, a little fairy, finds herself lost outside on a cold winter's evening. She comes upon a shivering elf boy, lost like herself, and together they try to find their way back home. Helped by animals and at last even by Father Christmas himself, they make their way through the woods to their own warm hearths. This is a warm and gentle tale that offers us and our children the generous Spirit of Christmas, all wrapped up in Daniela Drescher's beautiful images. Lift the flaps to find out! Young children love exploring the world of elves and fairies, and this time there’s more to discover! Lift the three or four flaps on each page to discover what’s hiding in the old tree, in the nest, in the grass, or under the leaves. The simple text asks "what's hiding in there?" This unique and entertaining picture book is ideal for preschool and early grades children. A really sweet book - In the Land of Fairies follows the fairy world through the seasons with a minimum of words and evocative, beautiful two-page illustrations that open the door to many more stories you can tell yourself. This is a storybook you and your child will gaze at and love. Sweetly rhyming verse and soft, luminous illustrations take you and your young child through the days and seasons in the Land of Elves. A lovely, lovely book for any young child. In the colorful style of her other two books, In the Land of Fairies and In the Land of Elves, Daniela Drescher's evocative full-spread watercolor illustrations reveal the secret, watery world of the merfolk among the lilypads, reeds, and rushes. Their magical world is shown through the seasons.